Miss Messy Mia (or just "Mia", for short) is a cosplayer from Gatineau. 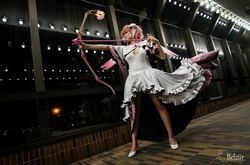 Being an avid fan of manga and anime, she began cosplaying in 2009. Since then, she has created a variety of cosplay, participated in multiple masquerades and won several prizes. This local cosplayer has recently attained Master-level in these competitions. She constantly pushes herself to develop her skills in various aspects of the hobby, whether it be in sewing, crafting armor, wig styling or creating accessories and props. Mia gladly offers her knowledge to those who ask, wishing to help fellow cosplayers with their own projects.